With mostly mild winter seasons, it’s rare that San Antonians have the chance to build their own snowmen. But with CPS Energy’s #SnowPeeps4Reap campaign, employees, customers and widespread family and friends were able to put their own creative touches on as many snow “peeps” as they liked – and it was all for a good cause. We built a microsite where the Snowtron 3000 produced a plain white snowman, with dozens of accessories that allowed builders to create their very own SnowPeeps. For every one they created and shared on social media, CPS Energy contributed $1 to our Residential Energy Assistance Program, or REAP, which helps disadvantaged elderly, disabled and low-income customers with small children pay their CPS Energy bill. While some outfitted their digitally-crafted snowman with traditional carrot noses and eyes of coal, others built electric linemen and snow cowboys. Most, however, created crazy mashups, with accessories that ranged from handlebar mustaches to hipster t-shirts, from pink tutus to mittens clutching cell phones. 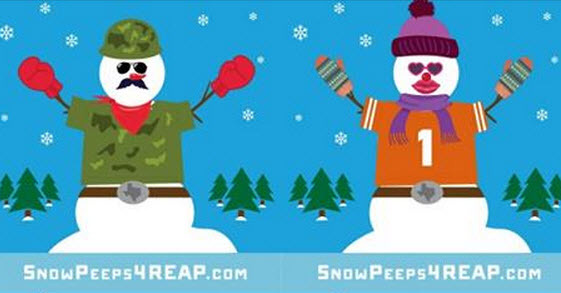 By the time our SnowPeeps campaign melted away for the season, it had gained national attention and generated a cool $9,672 for REAP. “This was the first time we launched a campaign like SnowPeeps4REAP, and it was a fun way to share holiday cheer while helping those in need,” said Yvonne Casanova, integrated communications manager at CPS Energy. A huge thank you to the CPS Energy graphic designers Micheal Freberg and Frank Jimenez, and to everyone who created a SnowPeep. You helped make this campaign a success, and more importantly, you’re helping neighbors who need assistance paying their energy bill.